After the results of any election, the question arises—what does it mean? Did the winner outline a clear policy agenda that voters responded to and want implemented? Or were the issues so muddled they offer little guidance? Interpreting judicial elections is even more problematic. In theory at least, it is desirable for judges to consider arguments with an open mind. Even the most ideological candidate for a judicial position may claim that he or she will do no more than “call balls and strikes,” with no concern about which side wins. Tim Burns chose to defy that tradition. He campaigned to make the more court explicitly liberal. His television ads promised Burns would “take on the rigged economy.” As the graph below shows, the primary results suggest that this was not a productive strategy. When a court is asked to interpret a law, its role is to declare what the law is, based on what the legislative and executive branches have done, and not what the court thinks it should be. Following these principles, the judiciary should never serve as a political check on the actions of the other two branches. It is not the role of a court to veto, or rewrite, laws that it believes are unwise or imprudent. One way courts promote stability is by respecting prior judicial decisions – a doctrine called stare decisis – and changing course from settled law only on rare occasions. Another way is by exercising self-restraint and acting only when it is abundantly clear that the court has the lawful authority to do what it is being asked to do. These promises, though, were undermined by his past activism, including being arrested for blocking abortion clinics, working to defend Act 10 and helping design the Wisconsin gerrymander. He defended these earlier actions by arguing that he well understood the differences between the role of an advocate and that of a judge. At a debate sponsored by the Milwaukee bar, I thought he played the part of a thoughtful judge quite well, contrary to the widespread belief he was a weak candidate. In the primary, Screnock won a plurality of the votes. As the graph below shows, however, his percentage declined from 46 percent to 44 percent in the general election. In her successful election Rebecca Dallet emphasized her advantage in experience, talking about her 20 years as a prosecutor and judge. A couple of her ads were copied directly out of the Wisconsin Manufacturers and Commerce playbook, accusing Screnock of letting rapists go free. However, the core argument of her campaign, in my view, was to restore the integrity of the Wisconsin Supreme Court. She argued the Supreme Court should not have shut down the John Doe investigation of coordination between the Walker campaign and various outside groups. She also argued in favor of a petition from 54 retired Wisconsin judges, for a rejected rule by the current majority of the Supreme Court, which would require judges to recuse themselves if they had benefitted from substantial ($10,000 in the case of justices) campaign contributions by one of the parties in a dispute. I think in Judge Dallet’s view of the world, she talks a lot about values but it appears to me, based on her public statements, that the First and Second amendments are not among those values that she would protect,” said. This is the kind of attack that tells us more about the attacker than the attackee. The First and Second amendments have become code words for some on the right. In this view, anyone who dares to defy the National Rifle Association is guilty of trying to undermine the Second Amendment. In her attack, Justice Rebecca Bradley is signaling that she is a committed ally of the NRA. 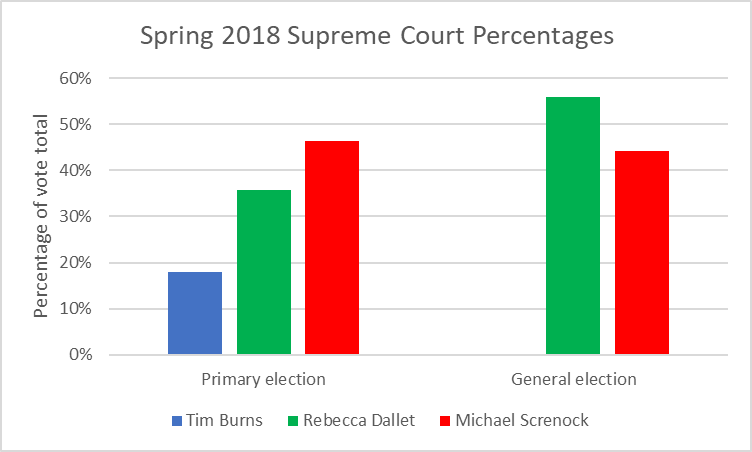 By mentioning the First Amendment, Justice Rebecca Bradley signals that she will continue to oppose the recusal rule based on campaign spending. Under the rule she opposed, groups and individuals would still be able to spend unlimited funds promoting a candidate they believed would make a good judge. However, if their interest were in buying a favorable decision, they would be out of luck, because justices would need to recuse themselves from cases involving big donors. However, the agenda of the court’s current majority is hardly limited to guns and campaign spending. It extends to protecting their political allies and themselves, as illustrated by its decision to shut down the John Doe investigation of coordination between candidates and supposedly independent groups like the Wisconsin Manufacturers and Commerce and Wisconsin Club for Growth, which spent heavily to elect the conservative majority on the court. In addition, the current majority sees its role as enabling the initiatives of the Walker administration. This is illustrated by two recent decisions. In the first (“Cochart”), it allowed the state to choose which appeals court district would preside over a lawsuit in which the trial court ruled against the Walker administration. In the second (Koschkee v. Evers), it seems poised to declare that regulations from the constitutionally independent Department of Public Instruction must be approved by the governor. Judges like Rebecca Bradley like to pretend that they have no agenda, that they base their decisions based solely on the law and the state and US constitutions. As she tacitly admits, however, they do indeed have an agenda. The problem is not that they are conservative; the late Justice Patrick Crooks demonstrated that one could be both conservative and independent. 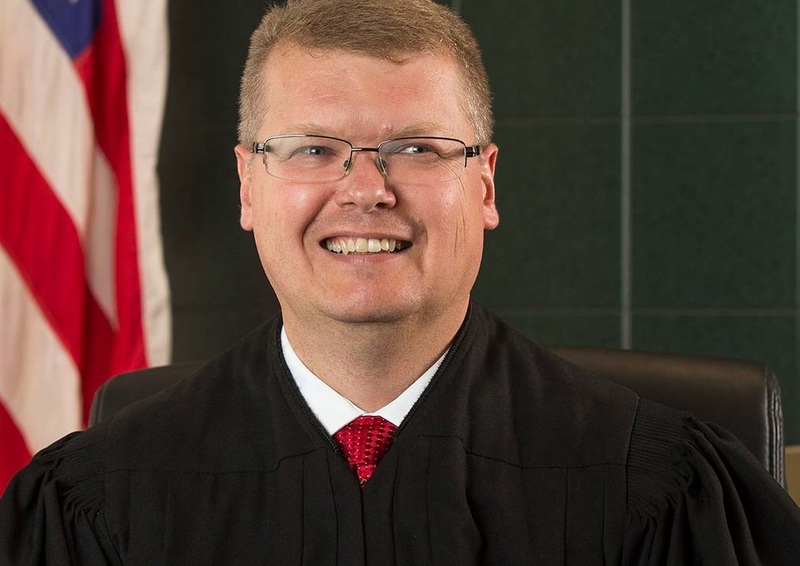 Screnock’s protestations that he would enter the court with no agenda were contradicted by the rush from right-wing organizations—such as the Wisconsin Republican Party and the WMC—to throw their support behind his candidacy. These organizations evidently believed they knew how Screnock would rule. Voters were wise to treat Screnock’s protestations of independence very skeptically. Dunno about ‘weak’ but certainly ineffectual, in the general election. Absolutely hammered for the WMC commercial re Skenandore, but never offered any response to the criticism other than to say it wasn’t his commercial. That was stupid. And Screnock had no media buy, at least not in the Milwaukee area, attacking Dallet’s “San Francisco values” road trip. But the real question, not that it matters now, is why was Screnock the conservative candidate at all?? A cynic might say that conservatives didn’t really care all that much about this race; it’s really 2019 (Abrahamson), and 2020 (Kelly) they care about. It ‘they’ can toss out Shirley, and keep Kelly, they’re right back to 5 – 2. And on the cheap!! What do I want from a Justice? Justice! Equal rights and justice! Dallet was not without special interests. She was just Burns Lite. She went to LIb Central [San Fran] to ask for money, for heaven sake. But she is an active mom with three adorable daughters. And she is pretty adorable herself, for a mom. THat’s why she won. 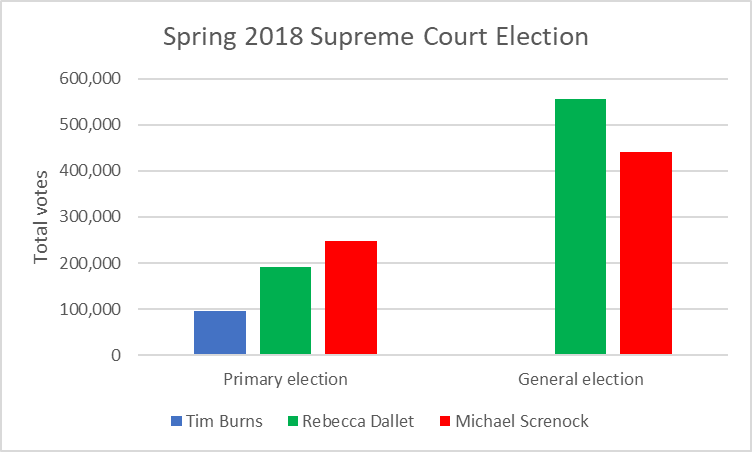 Dallet won because she was far more qualified and because Wisconsinites want a Justice who will recuse themself from cases involving big money donors to their campaign. It’s really simple. Screnock was compromised because he was hand picked by Career Politician Scott Walker and would not recuse, Dallet would. Tthis, combined with her vastly superior amount of actual experience as a judge,ed to her crushing victory over the republican charlatans! After years of being swamped by Republican’s vast corporate money as well as their greasy Dark Money in Wisconsin, finally Democrats are fighting fire with fire, and thankfully, WINNING! She won because she is an adorable mom? A comment both sexist and stupid. Congratulations.